The importance of social media in the industry is well known. 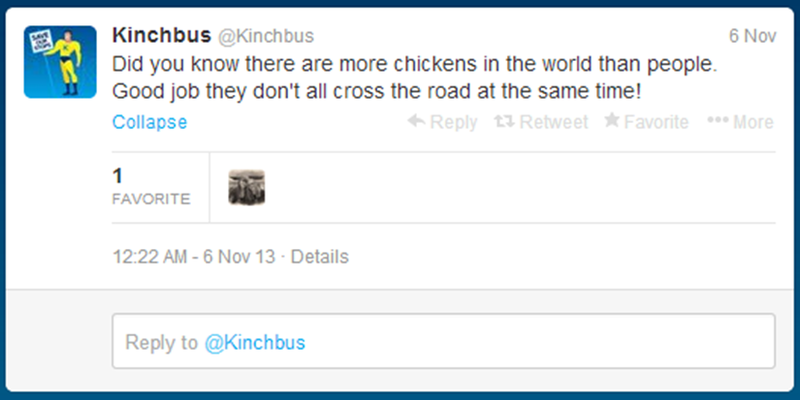 The vast majority of bus companies now have either a twitter or Facebook account, or indeed both. They’re tools that allow companies to connect with their customers instantly, to let them know of delays, changes to services or competitions. People connect with the companies to let them know of delays to their journeys and in doing so become a captive audience for promotion of offers and new and improved services. They also offer a new channel for raising complaints, and in a public manor never seen before. People can raise grievances that are public to everybody who comes upon them, as opposed to the far more private methods such as emails or over the phone. The response to these complaints is equally as public, and a non-response, or encouragement to sort the problem via another method, away from prying eyes, can often be more telling than the complaint itself. 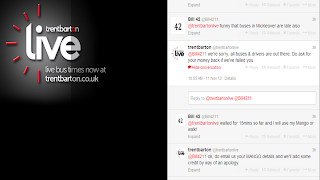 As ever, Trent Barton, who feature in the national top 100 league table for social media use, seem to do a particularly good job with regards to complaint tweets, apologising for and explaining the issue, letting customers know what action is to be taken (where relevant) and pointing the unhappy customer to the money back guarantee. The originally unhappy customer is suddenly reassured and is more likely to travel again- the perfect outcome. 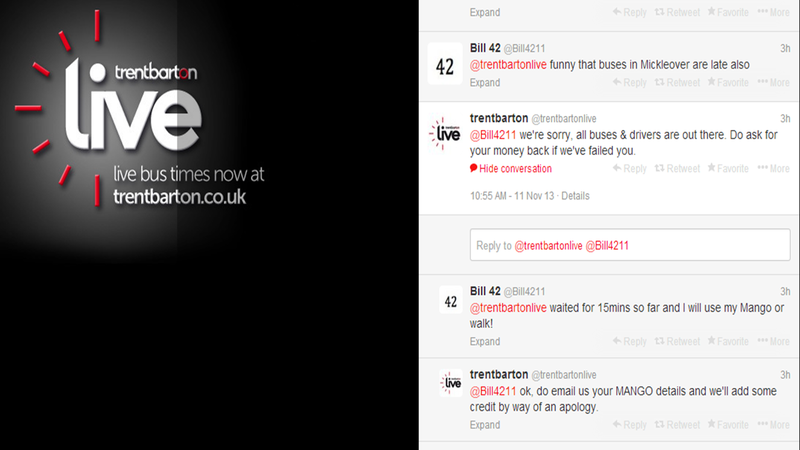 But Trent Barton are by no means the only operator to make good use of Twitter. Their rival, Yourbus, doesn’t receive the same volume of tweets as their older competitor but the ones that they do receive are handled very well. 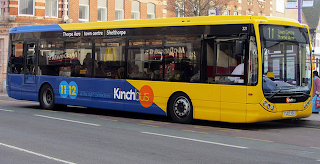 Also in the East Midlands, Nottingham City Transport make very good use of their twitter account, as do Wellglade’s smaller subsidiary, Kinchbus. Many of these also portray themselves as friendly, personable companies with the odd anecdotal tweet, which works to good effect (which no doubt Innocent Smoothies, the ‘king’ of social media, would swear by). 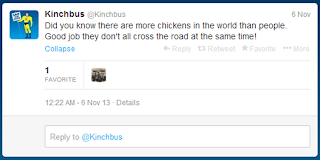 Kinchbus showing that they have a humorous side! 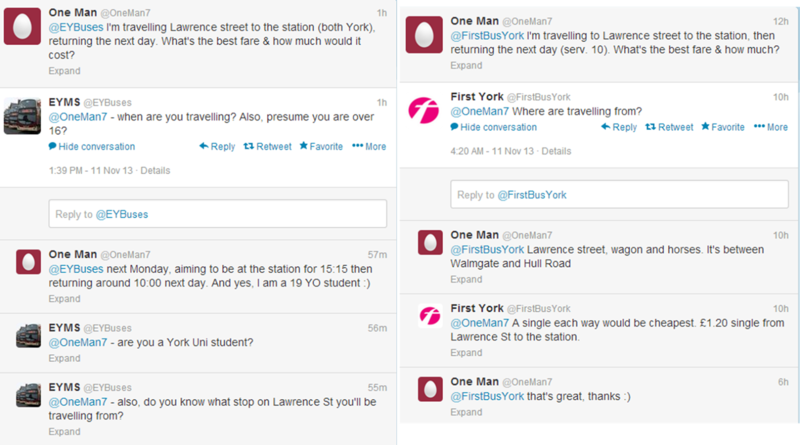 However, I must say that this evening I have been more than impressed by East Yorkshire’s twitter service. Not only was my response thorough and particularly helpful, it also came through minutes after my question, which was made at nine thirty at night. 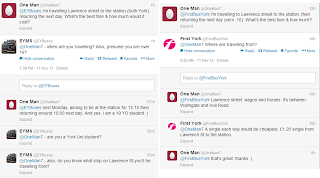 The journey for which I enquired was one I can make with either EYMS or First York and I posed the same question to both companies regarding fares, and I must admit I got a very good response from First as well. That’s exactly why sites like twitter are so powerful. As a customer, or indeed potential customer, I can get the information that I need in a matter of minutes, rather than having to trawl through websites or timetable books to get the information. When something goes wrong, twitter can be there for me to find out information, or let the company know how I feel. It is a fantastic tool for the industry, and it is reassuring to see how well it is being embraced up and down the country. 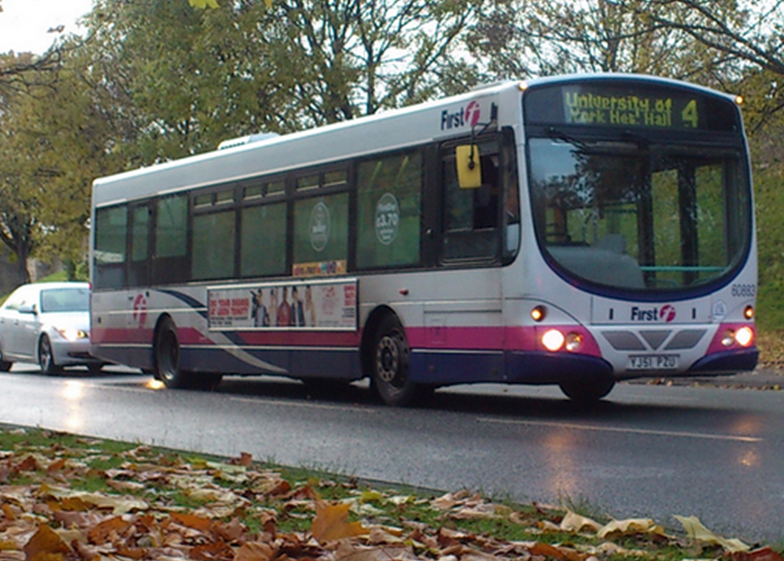 Buses are, without a doubt, crucial to the economy of the United Kingdom. Every single day, over half of all journeys made by public transport are made by bus, transporting the workforce to the workplace and the shoppers to the shops. Despite a huge increase in car ownership over the past few decades, there still remains a significant percentage who do not own a car, or who would rather eliminate the often extortionate cost of parking and end up on the bus. Without these people, the UK’s already flagging High Street would take a big hit. A total elimination of bus users is, of course, unlikely. What is perfectly possible, however, is a significant reduction in the number of bus users hitting the High Street. It is a perfectly foreseeable result in the town of Loughborough, if council plans are to go ahead. With the road system being totally redesigned, Loughborough’s Market Place would be totally off limits to cars. 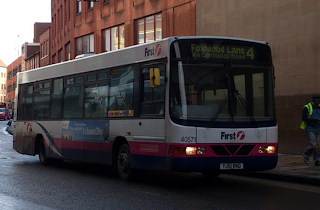 The question is, however, whether or not buses should be allowed to continue to use it. 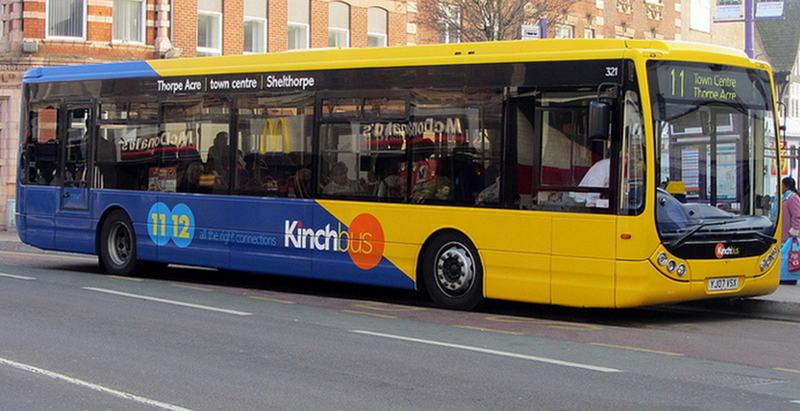 These buses currently drop off passengers on the street, at stops convenient for the town centre. The council is currently in a public consultation process, before making an ultimate decision. One of three outcomes will be decided, a total ban of buses down the road, or allowing buses to travel either in one or both directions. The notion of buses running down pedestrianized roads may seem like a bizarre concept, yet it is one that happens up and down the country. It can be seen in the East Midlands already, in both Belper and West Bridgeford. 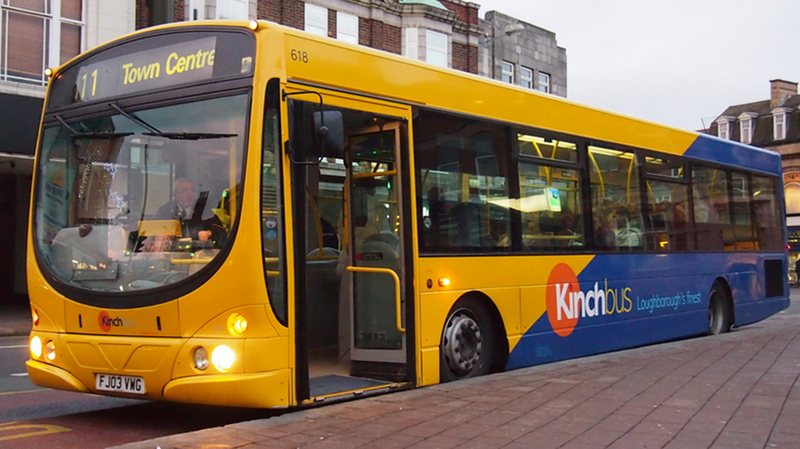 One of the main companies that could potentially be impacted by the change is Kinchbus. 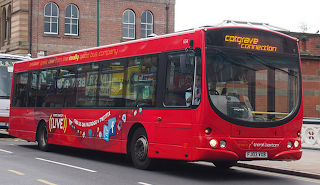 They are THE Loughborough bus company, linking the town with its suburbs and the major cities. Their customers no doubt make up a considerable percentage of the people spending their money in the town centre, and Tom Morgan, their General Manager is not happy about the notion of not being able to drop off in the current locations. We’re supposedly in an environmentally conscience time. Bus travel is capable of taking hundreds of cars off the road, and with green and hybrid technology being developed constantly, the buses themselves are becoming more eco-friendly. Surely then, our Government, at local and national level, should be encouraging people to use the bus? Yet, looking at the situation in Liverpool, where all the city’s bus lanes face closure, and now the situation in Loughborough, it does seem like a backwards step is being taken. Bus travel is not a nostalgic thing of the past. It is crucial to our success in the future, and if helped in the right direction, it can be a thing for good. Councils really should be doing everything they can to promote bus travel, and that includes making it a more attractive option. Bus priority measures are a fantastic way of doing this, and they should be implemented wherever possible. So, my opinion is very clear with regards to Loughborough. Complete access in both directions for buses. Agree with me? Then why not let your voice be heard. Fill in the consultation survey here. Last night I looked at how Trent Barton use the outside of their buses. The conclusion I came to was that, from a passenger perspective, it was well used, in that it promotes the products they offer in a smart, eye catching way. Fairly common on Double Deck buses across the country is the 'T' style advert board, utilising the space between the decks and where the staircase goes. Tonight, I'm going to look at operators who do things in a very different way. In particular, operators who ‘donate’ space on the outside of their buses to allow other companies to promote their products or services. This certainly isn’t the only occasion whereby Trent Barton and First York appear at opposite ends of the spectrum. First York certainly aren’t the only company to feature advertising, indeed it is somewhat uncommon for Trent Barton to not do so. However, seeing as both pass by my home and term time homes, they’re a fitting comparison in this instance. 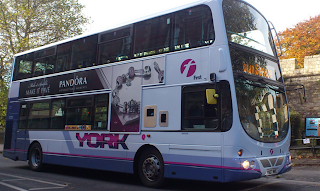 The fact that First York’s vehicles have, over the past year, featured the broadest range of styles of adverts also helps, of course. There certainly is an argument that having buses with third party adverts is a good thing. It means additional income for the operator, which in turn means a reduction in the price of fares. The counter argument to that is; ‘would more people travel if they weren’t travelling on moving billboards?’ Does the use of advertisements diminish the image of bus travel? Can Trent Barton attribute part of their success to not having advertisements? Contravision adverts also, in my opinion, drastically reduce the customer’s experience, by creating a darker environment and also reducing visibility out of the windows. Whilst I doubt it is high on many passengers’ priority list, many people say how they enjoy looking out of the windows of buses as they see more than at the wheel of the car. Putting an advertiser’s interests over that of passengers is a sin in my opinion and any company that does so needs to remind themselves that they exist to serve passengers and that should always be the focus. Advertisements are also not guaranteed to fit in with the livery of the bus itself, either. When time and effort is put into designing and applying a livery, designed to look both and appealing, it seems somewhat counterproductive to ruin this by sticking adverts over the top of this. TM Travel is a perfect example of this. Adverts were coarsely applied to the side of buses, covering up the company name and going against the curve of the livery. They looked rubbish. When adverts are applied in such a way, it diminishes the appeal of bus travel and worsens the impression people have of your product. For that reason, it seems that bus adverts do more damage than good. Finally, once an advert has been applied, there is the risk that it may not come off for a while. 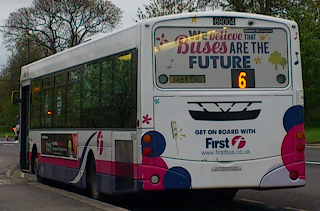 One sector that likes to advertise on buses is the film sector. 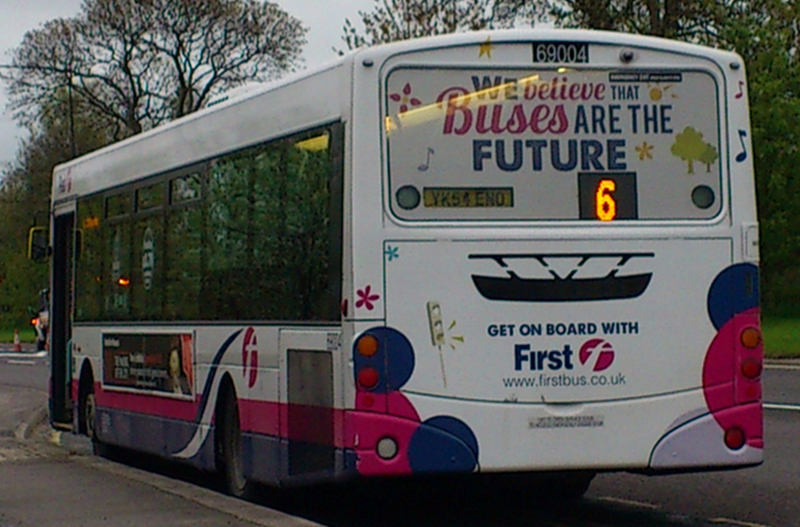 New releases will promote themselves on the sides of buses up and down the country, with Derby being no exception. Some years ago now, “17 again”, starring Zac Efron was released. Some of Notts and Derby’s fleet received adverts for the release that were still there a year later. Not because the contract was a year in length, I presume, just that there wasn’t sufficient demand for those buses to get replacement adverts. 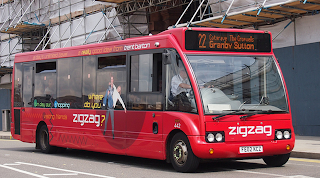 When certain companies are making an active effort to show that bus travel is still a good way to travel in the 21st Century, it seems that their good work is being undone with such scenarios where it looks like buses are literally stuck in the past. The other, even more disastrous outcome, is that the adverts start to disintegrate and the buses look even worse. So, from a passenger perspective, adverts on buses are a big ‘no-no.’ No doubt an accountant would tell me that I was mad, and that not having adverts would not be sustainable. So, are adverts a good revenue source for the industry that it’d be mad to get rid of, or are they an eyesore that the industry should move away from? I certainly know which camp I’m in, yet I can see things carrying on the way they are for some time to come. It seems that using a different browser has part-solved the issue. Apologies for the lack of updates, and the perhaps diminished relevance the post now has. Nonetheless, I hope you enjoy, and please feel free to give comments and feedback! 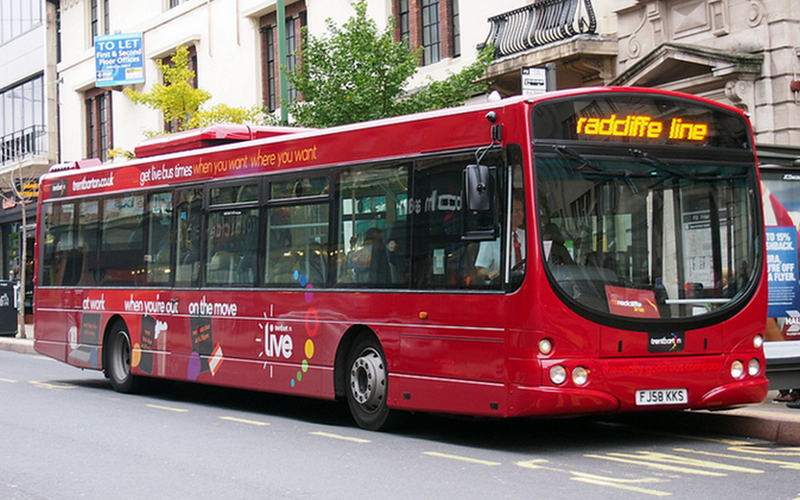 Route branding is something that we have all become far more used to in recent years. 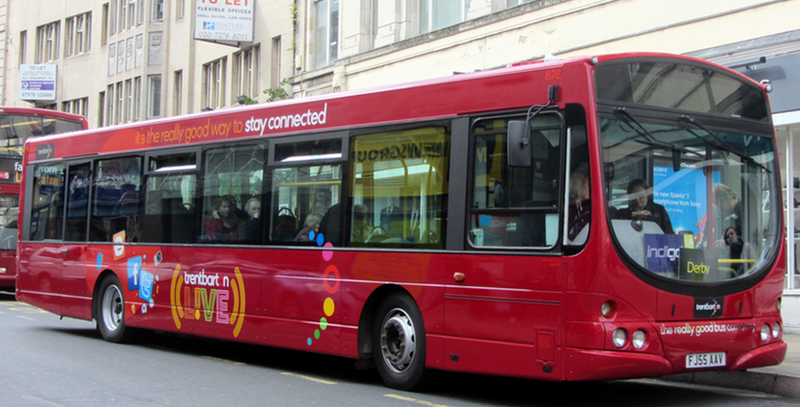 It is something that Yourbus, NCT, Trent Barton, Arriva, Kinchbus and Notts and Derby use in Nottingham and Derby to promote their routes. But the extent to which it is utilised by Trent Barton is unparalleled across the country. Since 2003 they have ripped up the rule book, doing away with a standard livery and route numbers, with the introduction of different coloured buses and routes being known by names. Of course, prior to 2003, brands were used by Trent and Barton. But these were often standard livery with a few stickers over the top, the exception being the ‘Rainbow’ routes. That’s a far cry from the situation today, where everything, from the exterior paintjob to the colour of the headrests, is in line with that route’s brand. 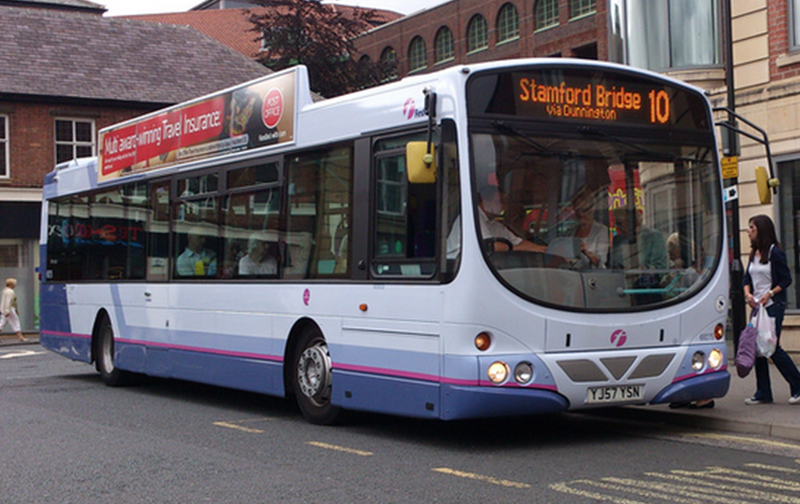 2003 was also the year that the standard Trent Barton livery was unveiled. This would be on show on routes that weren’t branded (of which there were far more at the time) and on the spare buses that would fill in for the ones ‘on brand.’ There was the odd exception, the migraine inducing frio livery, carried by three buses, and another livery promoting the zigzag ticket. The latter survived until very recently. 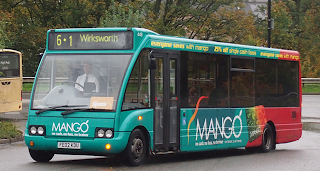 Four buses were restyled to promote the then new Mango smartcard, with a bus allocated to each depot. Between them, they travelled across almost every route, through almost every settlement, acting as free billboards for the product. What a great idea. 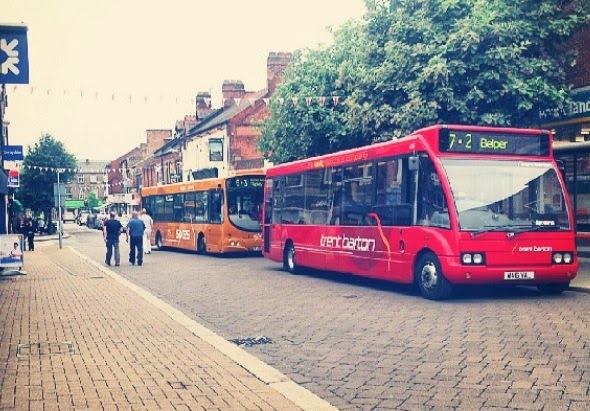 People across the East Midlands are used to having different looking Trent Barton buses driving around the place, a few more couldn’t hurt, could it? Especially when they are promoting various aspects of the company. Then, it appears a decision was made. Scania Wrightbus Solars had replaced a number of Excels on the Skyline 199, and a number were destined to be spares elsewhere in the fleet. 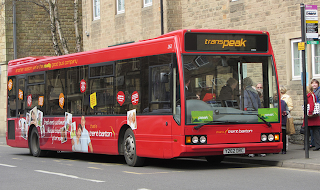 Of these, two reappeared in the ‘mum bus’ livery, declaring Trent Barton’s attitude that their staff should treat their customers the same way that they’d treat their mum. It became a talking point, I heard plenty of discussion about one of them when it was allocated to the Ashbourne services, thus showing that they are great publicity, they get the message across and they get people talking. These were later joined by a host more, with some promoting the new Trent Barton Live social media pages, some promoting the discount at Weatherspoons and others promoting the Zigzag play ticket. These were all things that set Trent Barton apart, and they were all things being well promoted across the network. Not long after, the new style of branding was introduced. Unlike in 2003, a standard livery wasn’t the first to be revealed, it was the i4 livery. Nor was it the second, or indeed the third. In fact, 18 months later and there still isn’t a standard livery, and it’s unlikely that there will be. 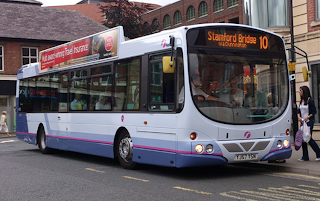 There’s currently 20 buses in the new style that are part of the spare fleet. Eclipse 727 was the first bus out of the paintshop in the new livery, and it was one promoting Mango. It was later joined by Solo SR 500 in the same livery. It was clear from the offset that it would be promotional liveries for the spare fleet, not a standard one. Whilst there isn’t a standard livery, there does appear to be a standard colour and style to the new style spares. There was much anticipation about what some of the former Rainbow 4 Wrightbus Solars would look like when they came out of the paintshop, but it’s fair to say that they looked very good, both inside and out. Solars 676 and 680 were the first two out, promoting the Trent Barton live social media and the zigzag ticket respectively. 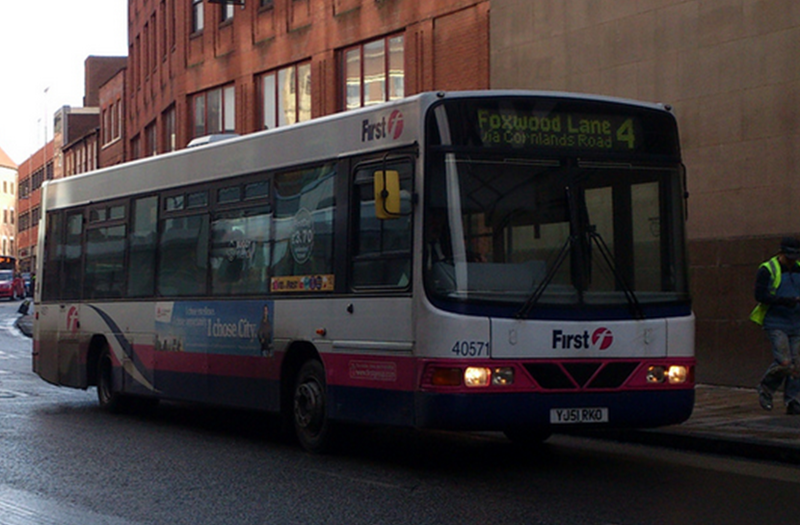 They were later joined at Nottingham by a third, telling passers-by about what customers thought about their service. They said great things, so why not shout about them? Gradually, all thirteen of the Solars appeared in these liveries. The best looking spare in the fleet has to be Volvo 724. In a unique gold livery, it really stands out as it drives around the East Midlands. Whilst being 100 years old is nothing to promote in itself, the motto of “really good, really local, really proud” says a lot. It also symbolises everything that the company has achieved over the past 100 years, not to mention the fact that it is this year supporting a very good charity, the Lewis Mighty fund. Now, there’s a new player in the team. Following the changes on Indigo, with fewer buses required it was time for Volvo 723 to get a new look. In less than a week, it was transformed from purple to crimson red, in a new livery promoting a new product. 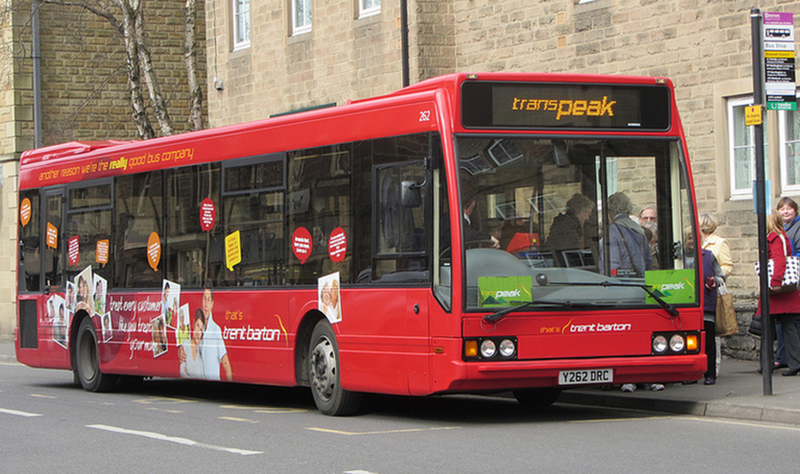 That product was, of course, the new Trent Barton live, offering live bus departures for every stop. It’s a very smart, eye catching livery, that promotes a product that would appeal to car users, no one enjoys standing round waiting for the bus. It’s therefore fitting that the latest addition goes back to the original point, should the spare fleet be in a uniform livery, or could the space be better utilised promoting the array of products offered? The answer to me seems simple. It’s easy to be nostalgic, and hark back to a day where all buses were in the same livery, but that’s no longer the case. 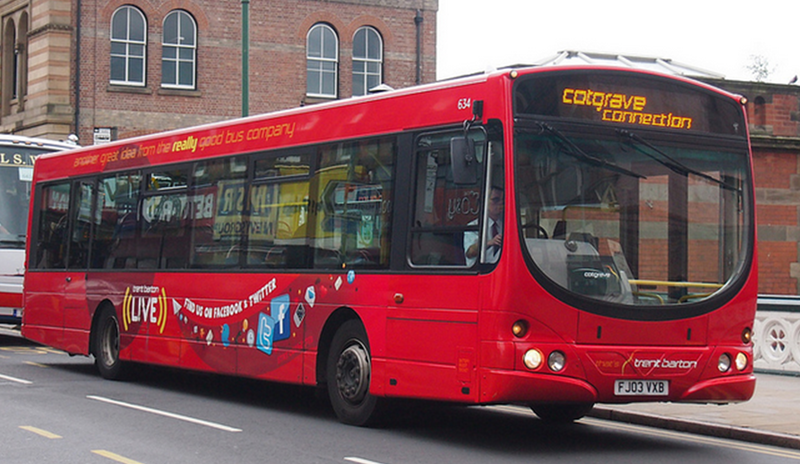 Bus companies are businesses, and the more people on their buses the better. There’s no better place to advertise than on the buses themselves, so, in my opinion, Trent Barton’s rather bold and unique step to do so is commendable, and seemingly very successful. The photos are again courtesy of Matt Burley.